Crowdfunding has really swept the world as a means to get things done. Got a weird art project or a game? Let people back you to reach your dreams. Need money for an unexpected medical expense or school function? There are people who are just waiting to help you out with that. 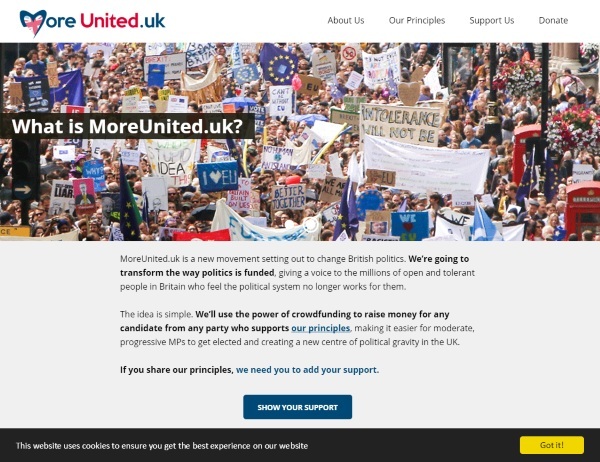 More United is the website that wants to make crowdfunding political. This is a UK only website whose goal is to fund politicians who support their particular, moderate beliefs. The idea is to help pull politics away from extremism by giving politicians who traditionally would not have the money to campaign heavily, the money to do so. We’re not sharing this website for political reasons. Regardless of how you vote, this use of the crowdfunding technology is interesting and, if it takes off, could usher in a new way of handling things when it comes to politics. And interesting idea. Check out the website to learn more.